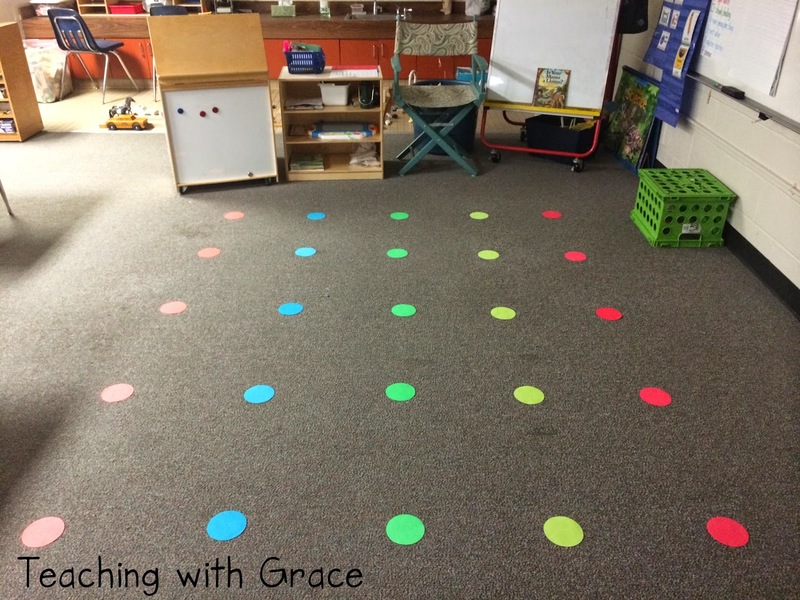 Teaching with Grace: The Answer to the Burning Question! As much as I'd love to take credit for making these adorable dots and creating them, I actually found them as an idea from another blog as a solution to not having a rug. I wish I remember who's blog it was but it was several months ago... I hate when that happens! Any who, you can get these from a company called Sit Spots. They have TONS of different colors, designs, and shapes. You can purchase for different seasons or all year long. I went with all year long bright colors so that I didn't have to trade them out. You can also get a great sample. I'm actually using the sample as the 'Line Leader Spot' so my line knows where to start. Let me tell you that my custodian is SOOOO happy with me at this point because I don't have masking tape all over my floor (any more... ;) )!